Air Quality monitoring is not an easy task, the common mistake which any one can do is representing city air quality based on single station value or single hour data. To provide an AQI representative of a city, single station data is not suitable. It may even mislead as it will be biased towards a particular activity or environment. As per international guidelines, correct way to know ONE index for a city air quality is to consider different microenvironments. Based on scientific knowledge one should develop the methodology for the same. For a typical metro city Background; Commercial; Urban complex; Sub-urban; Residential; Industrial; Road side; Traffic junction etc. are the microenvironments which should be covered in the monitoring network. 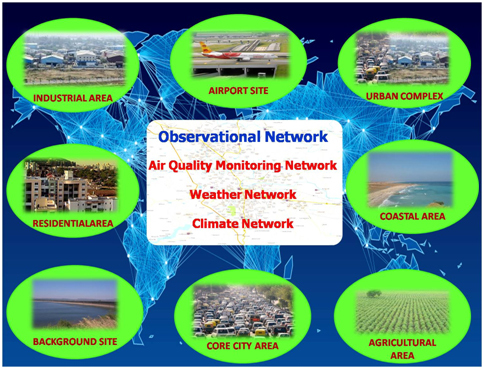 The SAFAR observational network of Air Quality Monitoring Stations (AQMS) and Automatic Weather Stations (AWS) established within city limits represents selected microenvironments of the city including industrial, residential, background/ cleaner, urban complex, agricultural zones etc. as per international guidelines which ensures the true representation of city environment. This is the first of such kind of network in India which continuously monitors all these parameters and maintain up to date data base with robust quality control and quality assurance. IITM is grateful to all their partners who have extended their full cooperation and support by providing the infrastructure and other facilities.